since my last email, i have visited dresden and berlin in germany and rotterdam and amsterdam in the netherlands. my one day in dresden made a big impression on me. for those of you that don't know the dresden history, i'll give you a little lesson. in the last months of world war II, the allied forces firebombed dresden and left it looking like "the face of the moon" (slaughterhouse five by vonnegut) 136,000 people were killed in a matter of hours and one of the prettiest cities in europe was no more. after the german split, dresden fell into the eastern german block and the german government decided that they were going to try to build some of the city back to it's glory. the results are amazing! out of a sea of cement communist block buildings, rises a piece of old world beauty graciously wrapped around the elbe river. they are still building block by block and i mean block by block. all the rubble was sorted through and all blocks that could still be used were categorized by computer so they could be put back into the building in the same location that they had been in before. the result is a 33% old and 66% new building that looks like it was built in the 1800's. due to the lovely industrial pollution of the eastern block, many of the new parts of the buildings are as dark as the originals, so it is impossible to tell which part has been rebuilt without looking at the post-war pictures. i stayed in a residential area of town that must have missed the ravages of bombing. its now very hip. there are tons of bars and restaurants and the people are so "cool". i was just hoping some of it would rub off on me if i sat near them! their coolness started to prepare me for berlin, which is certainly the hippest city i have been to thus far. berlin has an edge and really almost compared with new york for me. basically 70% of berlin was bombed in the war and the scars are all over the city. the old restored buildings are literally pock marked with bullet holes and the architectural layout is a mismatch of styles and sizes, which jarred me at first. all the history that happened there was screaming out and wanting to be heard at the same time. all i could think was that really bad history had happened on these streets. after all this was the city where hitler came up with the final solution and the city that the cold war was fought. somehow seeing the berlin wall in person again jarred my soviet memory. how could someplace be so bad that it was worth getting shot trying to cross the border? how could families be split in the middle of the night? (yes, the wall was built in the middle of one night while families slept.) maybe the soviets really were trying to take over the world??? and yet, in 15 years, the city has exploded. its so full of life and hope that its about to burst at the seems. the new architecture is a feast for the eyes. you can tell these architects were allowed to create their wildest dreams with no boundaries. thinking big gives the city a big bright attitude. the berliners are diverse, hip, and fashionable. i just happened to be in berlin for the love parade, a giant techno parade where the best techno dj's play from trucks and the music blares in the street. the people dance along beside them. buildings pulsed with the rhythm. last year, there were 1.5 million people and this year they supposedly canceled it, but it still went on with about 100,000 people, which was much more my speed. try to imagine that many people dancing in the streets to techno on fifth avenue. in berlin its possible! i also took the time to explore some of the ethnic and hip outer neighborhoods. there is a vibrant young urban family community and a huge turkish community. one last exciting thing: clinton was in berlin on his book tour while i was there and i bumped into a crowd outside his hotel waiting to see him. there were at least a 1000 people and he came out and shook every hand. it was totally moving. the next day, he was on the cover of every paper. they were calling him a berliner, a great compliment that was last bestowed on kennedy. the whole scene almost brought tears to me eyes. again i say we need a new president that understands the usa's role in the world and respects the role other nations play. if we had a president like that, the world would view us differently. anyway, back to the topic at hand... you can probably tell i am a big berlin fan but i had to move on to rotterdam. rotterdam is the home to the largest shipping port in the world, so i visited to see just what that looked like and i can tell you first hand that it is impressive! it too was bombed in the war so it is in the process of reinventing itself. there is cutting edge architecture shooting out of the skyline. what is different though, is the activity on the waterfront. as i approached the river, i couldn't miss the container ships speeding by in all directions. i took a boat tour of the port and got to see enormous container ships being loaded and unloaded. they said that there are now ships that can hold 8000 containers. if you lined them up they would reach 30 miles long. i'm sorry to say that none of those boats were in the part of the port i was in, but the boats i saw where bigger than anything i have ever seen before. as a waterfront advocate, all i could see was the economic power that comes from have such a vibrant port and it gave me new resolve to keep fighting for new yorks ports. the other thing i noticed is how diverse the netherlands are. rotterdam's streets were filled with people of all colors and creeds. (that is something i particularly missed in eastern europe and so i was really happy to get a chance to watch people.) it seemed like the real melting pot that new york tries to be. 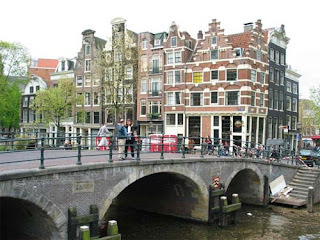 amsterdam is a city much like venice with canals built like avenues that seem to circle the city. today they told me that there are over 1000 bridges within the city. the architecture is mostly made of brick and the buildings are tall, narrow and pretty. many people live in houseboats that line the canals and lots of people have boats to travel the canals. also it seems like most people travel by bicycle, which is easier in a totally flat place. amsterdam seems to have a booming social scene with outdoor bars everywhere, enticing you to laze around with a fresh beer. the city looks young, rich and urban. the red light district is even more outragious then i expected. today i went out to see windmills, which was my most pressing reason for coming here. they are even quainter in person and the small towns that they rise out of feel totally different than anywhere i have been on this trip. the most interesting thing about traveling in the countryside is to see the canals in the big open fields. farmers travel by boat to their fields. the netherlands are all below sea level and protected by dikes throughout to monitor the water height. this means that there is lots of water flowing everywhere and the lushness of everything is apparent. the postcards show fields of tulips in the spring which is something i would love to see someday. this is my last new city, since i go back to london tomorrow to spend the last few days of my vacation with my sister. the trip has made the world smaller for me. we all eat, drink and wear similar brands. it has been yet another reminder that everything doesn't start and end with the united states. it also brought the damage of war even closer and made me want to learn even more about world war II. i will be back in new york in one week and will spend the next month enjoying the summer, attending the political conventions and getting ready for my trip to africa. it has been a great trip and i am glad that i still have the africa portion to go. i'll be happy to have a break, but i still have a little adventure left in me! 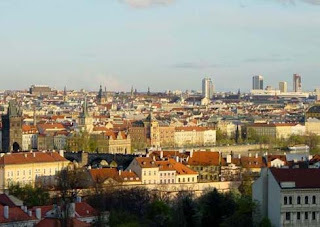 i am now in praha (or prague for you non-czech speakers) since i last wrote i have been to budapest, krakow and now here. for these three cities i am traveling with my friend, susan teitz. it has been nice to have companionship and to stay in hotels vs hostels. i was so happy to take a long bath in budapest and clean off three weeks of travel grime! all three cities are alike in many ways. they are each cities with castles on hills and rivers running through their centers. they share the hapsburg/austro-hungarian, world war two, and communist block history and share similar architecture from the baroque and renaissance eras. the buildings are unbelievably ornate. with every turn there is a building prettier than any i had seen before. i love the use of color. new york could use a fresh coast of pastel paint! i arrived in budapest after a full day on the train riding through the beautiful rural countryside. it was a bit hard to get into big city mode again. ljubljana is a tiny hamlet and budapest is the big time. at first i didn't even know which direction to go, since there was so much to see. i decided to just head out and must have made a correct turn because i bumped into katie callahan, a friend of mine from high school and junior high school. she was there for business and we caught up and she gave me the lay of the land. it reminded me again what a small world it is! the best thing about budapest is that is has many ornate public baths where one can go to get spa treatments and swim in their natural warm waters. the one i went too, the gellert baths, was enormous. there was a wave pool, that somehow made you feel like you were on an ocean beach jumping in the huge waves. the spas are not exactly like spas in the US. instead you lie in rooms full of people as loud hungarian women poke and prod at you. it was a great message though and i was able to have a glass of wine poolside afterwards! another great thing about budapest is the pastries. they are so good that we decided we should have them for breakfast. now thats vacation!!! our hotel was right across the river from the parliament building which is most ornate building i have ever seen. at night all the buildings are lit up and this one looks a bit like a mirage. how could people possibly carve such a huge sculpture and then work in it! the entire Hungarian parliament can only use 15 percent of the space, its so big. we survived our two overnight train trips. there were rumors of lots of crime, but really we climbed into our little bunks and slept the night away, in between big mean border guards waking us up to see out passports. the experience was a step back into soviet times. we arrived in krakow at 5am, which meant we could experience the main square with no one in it. it is a truly beautiful place. its that biggest square in eastern europe and is lined with cafes and stunning buildings. i had seen pictures and they couldn't capture its beauty. the centerpiece of the square is st. mary's cathedral. all i can say is "oh my god!" this is the absolute most ornate church i have ever seen and in the last month alone i have probably seen 200 churches including notre dam... this is the church that pope john paul II is from so you can imagine it gets some extra love from the catholics. krakow is very very catholic. you can't walk anywhere without seeing a nun and each of these nuns is from a different order so they wear great habits. the churches are filled with people praying and bowing. it is an awe inspiring experience. basically it is a small city. you can walk from one end of old town to the next in 10 minutes, but every step is charming. what is really hard to believe is that 15 years ago there were no stores or restaurants or bars, because there is a bustling shopping world there. in this way, the eastern europeans seemed ready to throw out communism and embrace capitalism. in other ways though, you can hear dissatisfaction with the free market. they complain of the loss of the social support system and the pain of rising unemployment as well of the fact that the communists are still in power under different party names and now they do an even better job of controlling the resources. while i am here, i have been trying to learn about the eastern european jewish experience. i feel like i owe it to my russian and polish jewish relatives. it means i have been seeing some pretty tragic things. each of the cities has the remains of ghettos which have been pretty much turned into museums since there is not much of a jewish population left here. although the museums are well done, it is sad to have to hear the story via a museum rather than learning from the actual living people. i was in krakow for the jewish cultural festival which arose out of poles wanting to know more about such an important part of their history. for me it meant great klezmer music everywhere! i also went to auschwitz. it was really weird to be there and realize that 60 years ago there were jews being killed there. i've been to so many holocaust museums and seen so many movies that i'm almost desensitized, but not quite. hearing and seeing the nazi plans in person gives them new painful reality to me. i also went to a salt mine outside the city, that has sculptures made carved out of rock salt by the miners who worked in the mines. there are 40 chapels carved directly into the salt so that the miners could pray since mining was very difficult work. its hard to explain what i saw, but suffice it to say that if you ever go to krakow, you should check it out. i was worried that after so many similar cities, prague would be a disappointment, but that has not been the case. prague is more architecturally diverse than the other cities so it keeps my eyes popping. also the revolutionary experience is really alive here. they are very proud of their history of student rebellion and i can only be in awe of them for their ongoing resistance against the soviets. as we all know their final rebellion was in 1989 and i keep wondering what i would have done. they were my peers. i'd like to think i would have been out on the main squares fearlessly fighting the military, but i really can only feel real respect for them and their struggle. its interesting to reflect on soviet communism again in my life. in 1986, i traveled throughout the USSR and got a chance to see soviet communism in action. this is bringing alot of memories to life. i have rambled on, but didn't want you to miss anything. now i must go have a beer since that is THE THING to do in prague!